Body Interfaces: A Processual Scripting is a performative installation generated by Tina Mariane Krogh Madsen over the duration of one week. It wishes to raise questions regarding the role of documentation in artistic research, its status and how it can feed into other processes. In the spatial frames of Grüntaler9 the artist will be intensively working with and redeveloping her own concept of an archive and resources based on the documents and remains from previous performances and interventions, which will additionally be resulting in other performance structures. The installation is in an ongoing process that can be witnessed everyday from 2-8pm. On selected days there will be guests invited to discuss and perform with the artist in the space. ::::::::: Tina Mariane Krogh Madsen’s research works with the body and (as) materiality via combining understandings of it that are derived from site-specific performance art and from working with technology. 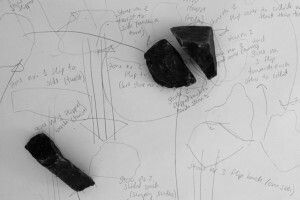 A crucial part of this research takes the form of interventions and performances, collectively titled Body Interfaces, first generated during a residency in Iceland (May, 2015) and since then developed and performed in various contexts, constantly challenging their own format and method. These practices deal with the body as interface for experience and communication in relation to other materialities as well as the environment that surrounds and interacts with these. The interface is here read as a transmitting entity and agency between the body and the surrounding surfaces. An important part of Body Interfaces is its own documentation, in various formats, shapes and scripted entities. The processual installation is open daily from 2-8pm and can be witnessed at all time. The processual scripting has a dynamic approach to the space and therefore the installation will arrive and evolve throughout the days, nothing has been in installed in advance – all is part of the process. The research topic will be shared through performances and interventions as well as an ongoing reel of performance documentation.